"I really enjoyed this book, which consisted of a series of interviews with all kinds of doctors--different specialties, ages, personalities, etc., with the one similarity being that they currently or at some point have practiced in the Midwest (the location of the journalist author). Well, that and they all seem to love their jobs with a passion. I found it consistently interesting and inspiring. It was long, but I sort of wished it had been even longer. You really get a sense for what it takes to get through medical school and residency, and that it's not for the faint of heart. There are laws now stating that residents cannot work more than 80 hour weeks or more than 30 hours in a single shift, which for the regular old office worker, seems like an extremely intense LOW limit--yet for these doctors, they almost seemed disparaging of it. You definitely have to be a workaholic. I also enjoyed hearing about how some of them seemed to really connect with certain patients, which to me is sort of unheard of in our modern medical system. Even though I've had very good doctors in the past, I certainly haven't been able to spend enough time with them, nor forge a connection. But then I think a lot of those stories were from longer ago. The stories covered a huge range of topics, which was great. There were doctors talking about our dysfunctional insurance system, doctors who lobbied for gay rights (it seems unrelated to medicine, but he was coming at it from the angle that this causes a lot of children to go uninsured--because their gay parents cannot get married and so sometimes they cannot get coverage), doctors who (impressively) work in end-of-life care and seem to love it, doctors who have come from wildly different pasts and other careers, etc. Every story was something different." "As a physician, I am often skeptical of books proclaiming "insight" into the world of medical training and practice, and therefore began this book with a jaded eye upon receiving it as gift from a friend. However, Mr. Busalacchi renders a collection of interviews that are as informative as they are touching. I was impressed by the breadth of topics, covering everything from early training, residency, a variety of practice styles,and even the politics of health care. With such a wide variety of topics, it would seem a difficult task to keep the average reader interested, but White Coat Wisdom pulls it off with style. Great gift for medical and non-medical people alike." "(This) ‘oral history’ is engaging in every case. Unlike ‘news-magazine’ television shows, where the interviewer’s goal seems to be to phrase questions in order to push their own agenda and to hear their own voice, with the physician guest barely getting a word in edge-wise, Mr. Busalacchi’s interview style is a light touch of questions, and while letting them speak as they will, their very human side emerges. His engagement with his subjects has a very natural cadence." “This is oral history at its best. Perhaps best of all, their stories are page-turner interesting. "The book is clear, concise and well-written." "Doctors' lives are always interesting, especially when the reader is allowed behind the curtain. White Coat Wisdom is a good read for anyone, but of course, of special interest to the growing number involved in health and medicine." "Busalacchi has compiled oral histories from a wide variety of Wisconsin physicians. The author tells us in his introduction that he is an admirer of the work of Studs Terkel. Even had he not so informed us, isn't it the case that all works of this kind are compared to that of the late Studs, and most found wanting? Busalacchi makes a solid, workmanlike effort to walk in the steps of his role model, and he succeeds more often than not. He has mastered the ability to allow his subjects the floor, and the practice of medicine from the view of the dear and glorious physician is expressed with all the triumphs and tragedies that are part of that world. "Written by a seasoned medical journalist, [White Coat Wisdom] shares the insightful stories of 36 Wisconsin physicians from diverse backgrounds and specialties." "Anyone who wishes to legally call themselves a health care professional must spend years upon years in medical school and college - certainly these people pick up information the general public never hears about. "White Coat Wisdom" is a through and complete compilation of these little tidbits of advice and knowledge to help you maintain peak physical health - and tips on maintaining peak psychological help as well, covering both tips on disease prevention and achieving greater satisfaction in life. 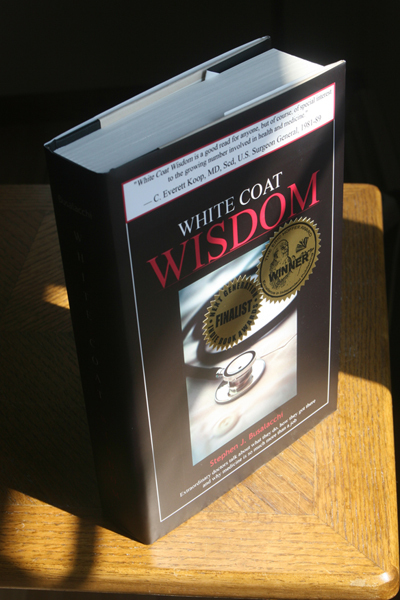 "White Coat Wisdom" is packed cover to cover with what it's title promotes, and is highly recommended for those reasons. "Medicine and health care have been undergoing exponential changes that affect patients, providers, and those who finance this immense undertaking. White Coat Wisdom is an easy read that offers insights into the many influences on care from those within the profession. It is just plain enjoyable reading. And for those who might be considering entering the profession of medicine, it certainly reassures that doctors are as varied as our patients! A good read." "It is Busalacchi's interview style and the open and honest answers that give the book an air of integrity and intimacy making it a worthwhile read." "I finished your book a couple of weeks back and really loved it. I'm loaning it to a student in our department (agriculture journalism) who is interested in becoming a doctor. Perfect reading for him! Nice job!" "Inspiring...What treasure this state has in its medical professionals."